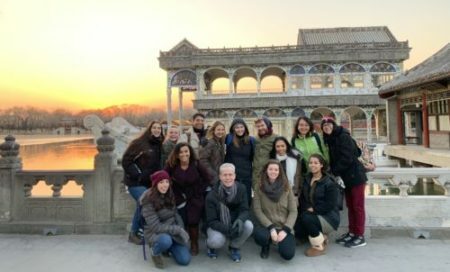 USFSP students spent two weeks in China this winter break visiting world renowned cultural destinations, taking classes and connecting with fellow Chinese students. (Jan. 14, 2019) – During the academic calendar, winter break is usually a time for students to return home and rest between semesters. 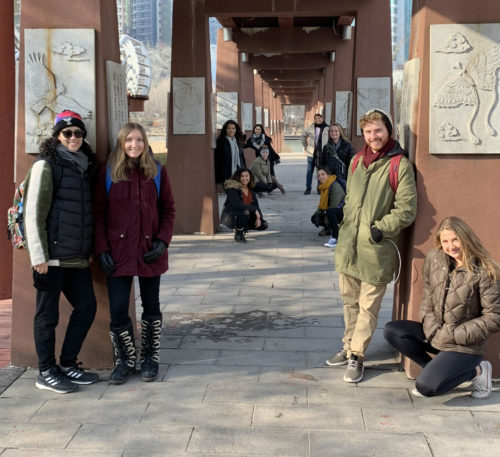 For 12 students in the Honors Program, this winter break provided them with the opportunity to fly across the world and immerse themselves in the history and daily life of China. USF St. Petersburg students spent two weeks visiting world renowned cultural destinations like the Great Wall and the Temple of Heaven as well as the skyscraper-filled capital of Beijing. But their home base was the provincial and rustic city of Weifang. Students spent their days taking classes on Chinese language, calligraphy and history at the University of Weifang and their nights connecting with peers and experiencing Chinese life first-hand. The goal of the program was to fully immerse students in the China experience through classes covering a wide range of topics as well as social activities. Combining academics with social experiences gave these students a glimpse of what life is like in the developing global power. The group of students with Professor Smith at the Forbidden City. The opportunity was made possible through a cooperative agreement between USF St. Petersburg and Weifang University that was signed in 2017, which paved the way for internship opportunities, exchange programs and affordable abroad experiences like this. The connection with Weifang, traveling in the chilly month of December and additional scholarship money kept the travel price modest, which was a major selling point to many who went on the trip. “I was always interested in China, but what really sold me on the opportunity was that the price was fantastic,” said Senne. In addition to learning about recorded Chinese history stretching back 3,000 years and experiencing the Forbidden City and Tiananmen Square, students picked up practical knowledge from their Chinese counterparts. “They would teach us how to haggle in supermarkets to get the best price,” said Senne. Students also saw future opportunities for themselves in the country. In Weifang, they visited the AMERI-CAN International Academy and Behai College, where several recent USFSP graduates are currently teachers of English. Since returning stateside, students and professor are reflecting on their international experience and differences between life in America and China. 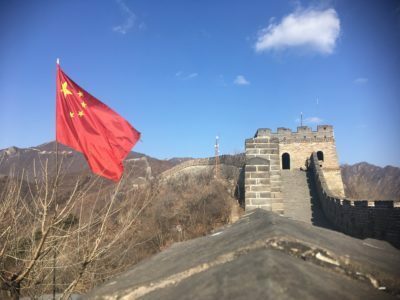 “I only had a theoretical knowledge of China before this trip, so I was struck by how little activism there was for things such as local environmental cleanups, how there was surveillance nearly everywhere and how politics for the people was something that happened in Beijing, but not anywhere else in the country,” said Smith. Students kept a journal on their personal experiences that they will submit for coursework. Each is also writing a research paper on a topic of interest. For Senne, she is focusing on the environmental issues China is facing, such as air pollution and deforestation. But the biggest lesson learned, echoed by Payne, Senne and Smith, was the similarities between people of very different cultures.